The Morrigan is always thought of first as the shape-shifter who flew over battlefields amongst the dead and dying as a crow or raven, seen to clean away the decay, as crows and ravens do. Wherever there was battle, legend has it the Morrigan would be there. But not so fast…many of us today who revere the Morrigan know a different side of her as the one who gives strength to those who must do battle in our daily lives, no matter how small or large the war. And, we may see her as the death goddess but there are many forms of death…we “die” to old habits and old ways of doing things which do not serve us any longer. 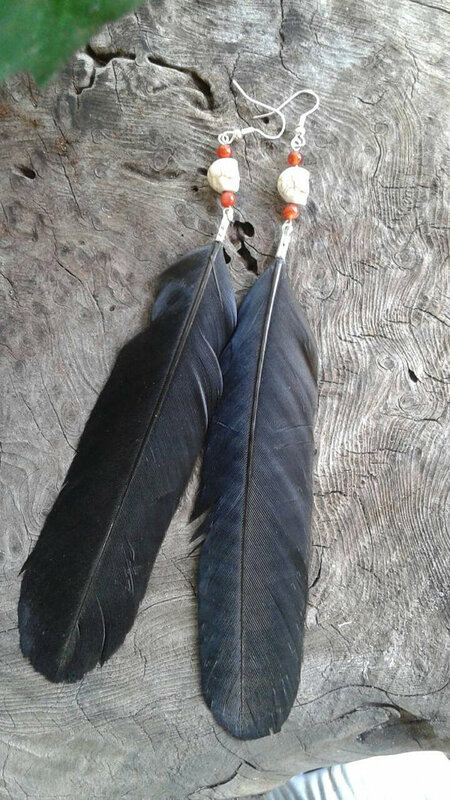 This is the representation I present in the Morrigan Crow Feather Earrings to remind us we have a strong ally in our daily battles which can and sometimes does, include small deaths of sorts as we clear away the decay of things that need shifting out of our lives. We no longer make these, however, if anyone is interested, please convo me at our Etsy Shop and I’ll be happy to create a pair just for you. This entry was posted in Business, Etsy, Magickal, online shop, Pagan, Wiccan, Witch and tagged Carnelian, crow feathers, English crow feathers, English witchcraft, howlite sugar skulls, jewellery, Morrigan, Morrigan earrings, occult, pagan, sorcery, the Morrigan, traditional witchcraft, Wicca, wiccan jewelry, witch, Witchcraft. Bookmark the permalink.